The origins of this blog date back to 1967 when I spent six months in Tours, France as a student at the Stanford-in-France campus there. Stanford had leased a lovely building overlooking the Loire River just where it is crossed by the Wilson Bridge. My room had a balcony that looked out on the Loire and the elegant bridge. Our group travelled throughout France, and went to England and Italy. I found I enjoyed talking to complete strangers, often over a wide chasm in language, and had many wonderful experiences as a result. 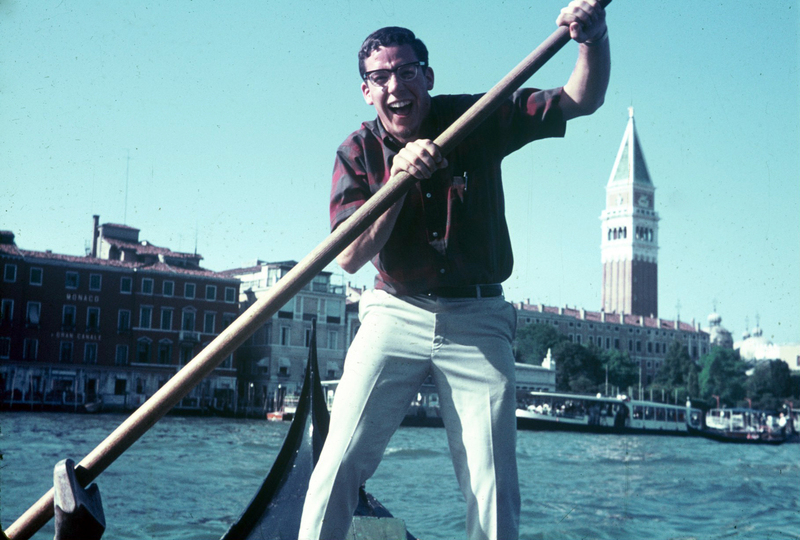 In Venice, midway across the Grand Canal, I used sign language to ask the gondolier if I could row the boat. He laughed and pointed toward the water, implying that I would fall in. I didn’t. My stay in Tours began two lifelong love affairs: one with the French countryside, its cities, people, history, and culture; and a second with Josette Brotons, an English student at the University of Tours. Two years later we were married and we have been together now for over four decades. We lived for 40 years in Canada, where I was first a university professor of economics and then a university president. Marriage took my French from miserable to fluent. All three of our children–Eric, Leslie, and Audrey–spent their early years in Montreal and spoke French before English. Beginning in 1986 we spent our annual vacation in Touraine, which became a second home for us. Most years we were in Saché, a village southwest of Tours known for its physical beauty and as a residence for Honoré Balzac when he needed to escape the social pressures and hounding creditors of Paris. We were also able to travel around France and spend time in Paris. 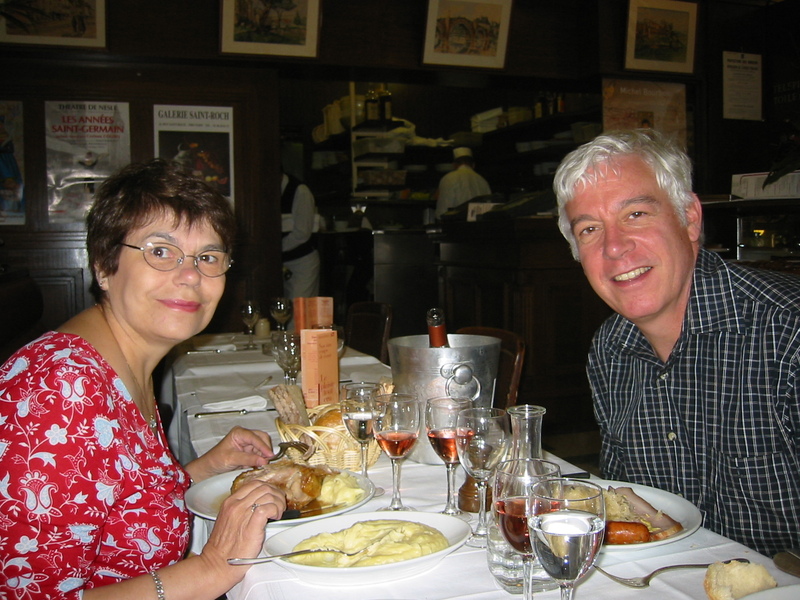 The picture below shows Josette and me on the left bank in Paris at the Brasserie Balzar, which occupies a chapter (“The Balzar Wars”) in Adam Gopnik’s wonderful book, Paris to the Moon. Josette had a sensible roast chicken, while I had a choucroute (sauerkraut with a ton of meat) which could have fed a small regiment. The bottle of Sancerre rosé made it all OK. So for a boy born in Summit, New Jersey, and who has lived most of his life in Canada, France became a central part of my life. That link was strengthened when in 2001 the French government honored me as a Chevalier de la Légion d’Honneur (Knight of the Legion of Honor). In July of 2009, after serving 15 years as the President of The University of Western Ontario, I retired with Josette to Tours, the very city where we met 42 years earlier. We were just in time to celebrate our 40th wedding anniversary. Our apartment looks out on the Cher River, which 30 km upstream runs under the Chateau de Chenonceaux, an extraordinary structure which I have put at the top of the blog. 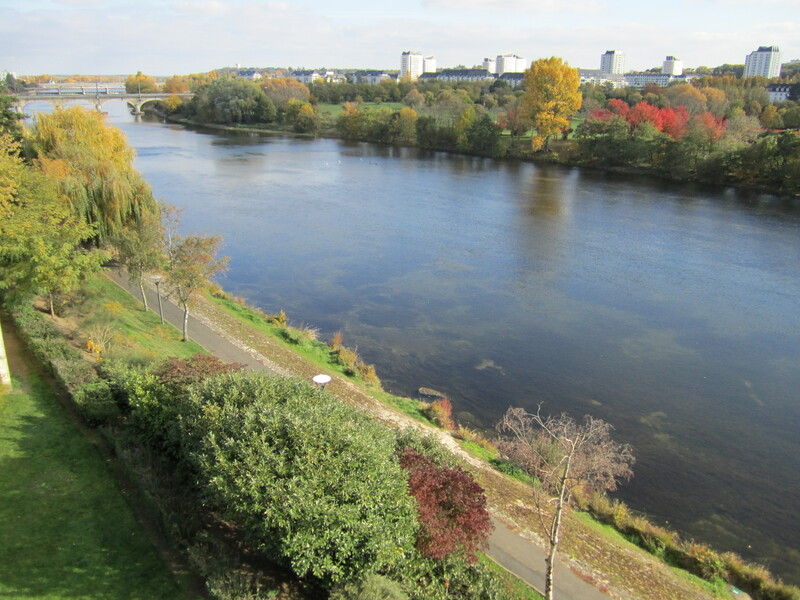 The picture below is from our balcony, looking upstream (east) in the direction of Chenonceaux. Happily, our youngest child, Audrey, came with us to Tours and now has her own apartment here. Her older sister, Leslie, who lives in New York City, comes at least twice a year to join us in Tours. 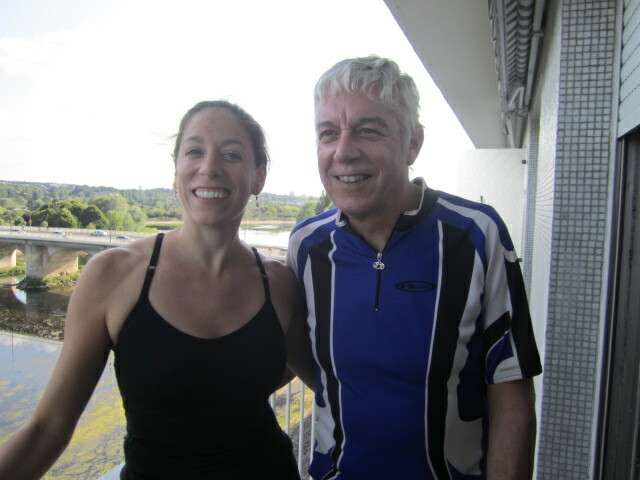 Leslie is a gyrotonics Master Trainer and a stronger cyclist than her dad, so when we go out together on the bikes I get a real workout. Our son Eric and his wife Karen have four young four children. We look forward to their first visit to Tours when the kids are a bit older. Since our arrival in the Loire Valley, Josette, Audrey, and I have been exploring France, in theatres, museums, vineyards, and landscapes all over the country. Josette has a profound knowledge of French history, cuisine, and culture, and often serves as our guide. And I have been riding my bike through the scenic valleys and farmland of Touraine; each year in May I am joined on my bike trips by students and alumni of The University of Western Ontario. And for those who don’t ride bikes, Western Continuing Studies organizes in June a ten-day trip to Paris and region–I serve as guide and take the group on walking tours of the City of Light with an emphasis on Impressionist sites. Come join with all of us in discovering France. Vive La Belle France, Papa:)!!!!! Can’t wait to meet you in May, Dr.D!!! Thought I’d check in & see what’s new on your blog. It occurred to me that since your focus hear is so heavily French, you might expand your readership by maintaining a French version of your site. Cheers, sister Jane. I stumbled on your site as I searched information on Footsteps of impressionists. My husband is an avid admirer of the Impressionists and his 50th birthday is coming up end of September. I would love to organize a 4 or 5-day trip to Paris and Giverny, and follow the main steps of the big masters. We live in Texas- can you please help me with some information? where should I stay? are there are tour on foot for this purpose in Paris? I am very grateful for any further information yo could give me. I hope we can join you one day on your tours as well. I recently read “Paris: A Love Story” by Kati Marton. It is mostly about her life and loves in Paris but she also writes about studying in Tours in 1967. I was part of a group of students from Ohio who spent the entire year in Tours in 1968-69. I had a great time and have wonderful memories of the region. We also spent time with students at the Stanford campus which I recall was along the river. I was looking around for some information about Tours and I came across your excellent blog. Interestingly like you I ended up moving to Canada. I have lived in Vancouver since 1972. My 20 year old daughter is now planning to study at Sciences Po in Paris in January. I am looking forward to visiting her there and I hope to also travel this spring to Tours where I have not been since 1968. Très joli site…. bravo à cet amoureux de la France. Très très joli site, bien qu’il me fasse traduire car je ne suis pas très douée, et que de belles photos, vraiment superbe !!! Pa contre quel pincement au coeur de vous revoir en photo !!! En ce début d’année, je vous souhaite une excellente année 2015 et au plaisir d’échanger avec vous.